The VOC laden air is cleaned as VOCs are adsorbed by the zeolite media as it passes through the rotor. 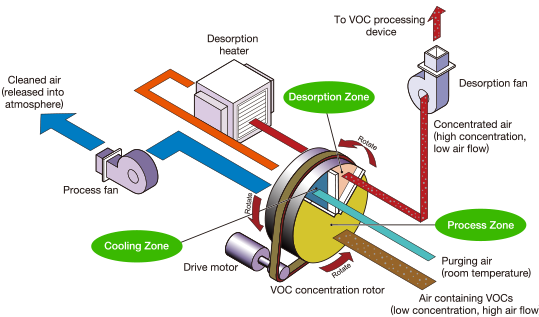 The rotor, which has adsorbed VOCs, is moved into the desorption zone as it is rotated, and the VOCs are desorbed and concentrated by hot air (180 – 200°C). The concentration ratio can be between 3 to 30 times. In order to recover the adsorption capacity of the media after it has been exposed to hot air inside the desorption zone; the media enters the cooling zone where it is cooled down by process air or fresh air. Simultaneously, the cooling air recovers heat energy as it passes through the rotor. This heated air is then used for desorption resulting in an energy efficient system. SOLVENTCLEAN is optimal for a large airflow volume with a low concentration of exhaust gas removal, and can reduce the operation cost for entire system. 99% VOC removal efficiency can be achieved. Honeycomb-structured adsorbent allows for low pressure loss and removal of large volumes of VOC exhaust gas while minimizing the operation power usded for the process fan. By using continuous desoprtion, the removal efficiency of SOLVENTCLEAN is more stable than that of raditional batch type concentration. As an option, SOLVENTCLEAN can be equipped with a high temperature desorption system which can remove the solvents with up to 300 ℃ boiling point accumulated in the rotor. 100% of the materials used to construct the rotor are inorganic and non-flammable . Simple construction of the rotor allows easy maintenance.